One carpet cleaning chemical does it all: Pre-Spray, Extraction & Rinse, and Spot & Stain Removal !! Stop being a mobile chemist! There is no need to carry tons of carpet cleaning chemicals on your truck. Code: Green will do it all! Plus, Code: Green is approved by the EPA's Safer Choice Program. This means Code: Green contains safer ingredients to help play a role in families’ health and the environment. Per the EPA, "Safer Choice is EPA’s label for safer chemical-based products. Every chemical, regardless of percentage, in a Safer Choice-labeled product is evaluated through EPA’s rigorous scientific process and only the safest ingredients are allowed. For over 15 years, the program has labeled products that are safer for families, pets, workplaces, neighborhoods, and the environment. The label represents leadership in safer product formulation" (EPA Safer Choice website). Code: GreenII was designed to be your all-in-one carpet cleaning agent. Why search for a product for extraction, then another one for pre-spray, another for traffic lanes, and another for spotting? Code: Green will do all the above in one product! Code: Green will save your business time, money, and will meet "Green" requirements for your business. 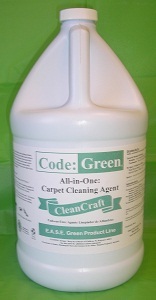 Code: Green was developed to take the place of multiple carpet cleaning products. This product works great on carpet, upholstery, and many other fabrics and surfaces. Code: Green is fortified with the cleaning power of Hydrogen Peroxide. This product attacks most stubborn soils & stains to produce excellent cleaning results. Code: Green provides superior cleaning while neutralizing alkaline carpet shampoo residue left behind from previous carpet cleaning. Leaves carpet fibers clean, soft, and deodorized. No rinsing required! Common Question: Sure, it's "Green", but does it work? YES !! In testing, Professional Cleaners have tested and rated Code: Green as a product that: Cleans better than many of their current cleaning chemicals, reduces the number of cleaning chemicals needed to clean carpet & furniture, and saves time on the whole cleaning process! Why use a "Green" product? Here are just some of the many types of customers that recommend or require the use of "Green" products: Government facilities, commercial facilities that are applying for LEED-EB certification, schools, hospitals, and many of your residential health conscious customers! Take a look at the video clip down below. Could you use a marketing advantage? Code: Green is truly an amazing product. This one product can be used as a Pre-Spray, Extraction & Rinse, and a Spot & Stain Remover… all in one product! Better Cleaning Results: Running the cleaning chemical through your extractor actually improves your cleaning results. Running plain old water and/or rinses through your wand does not have cleaning power behind every stoke of the wand you take. Plus, don't worry, Code: Green is neutral pH and doesn't contain fillers, so it is safer for your pumps & internal parts. Quicker Cleaning Times: By not having to Pre-Spray the whole room down, you actually shave minutes of cleaning time off each room. An 8 room home can save you about a ½ hour of time! Time is money! Less Overhead: Why do carpet cleaning chemical manufactures & distributors think you need to be a mobile chemist? As a carpet cleaner, our trucks are already overloaded with stuff. Your chemicals do not need to be part of the problem. Code: Green reduces the amount of chemicals you need to carry. Again, one product does it all. Less Training: Ask 10 carpet cleaning technicians how they should go about cleaning something, and you will get 10 different answers! Code: Green simplifies training. Since you can safely & effectively clean any fabric that can be wet cleaned (carpet or upholstery), there is no training. Just clean! Safety & Greening your Business: Code: Green is approved by the EPA’s Safer Choice Program. This means Code: Green meets the EPA’s stringent list of safer ingredients. The health & safety of your employees and customers’ family & pets are important. Do your part to safeguard them by choosing Code: Green. Money Savings: All the above = Less Costs. Improve productivity & income. The future of cleaning is here. Code: Green will improve your cleaning abilities, speed up your cleaning time, reduce your inventory, make things easier for you, and save you money! Deodorizes as it cleans! Don't Forget to check out our Code: Green Documentation !! Click on the "Available Product Documentation" link below to see our product flyer, view our tech spec sheet, and a very cool Code: Green Comparison Worksheet to see how your business can benefit from using Code: Green. How can Code: Green save me money? Many professional carpet cleaners compare the gallon cost of a product and choose based on price. However, this is not an accurate way to compare savings. If you were to add up the chemical costs you use on a job, you would quickly notice that chemical costs are pretty insignificant. You may use a couple bucks worth of chemicals on a $100 job. Where you recognize SAVINGS is in time reduction. If you can reduce chemical mixing time and cleaning time, this is where huge savings are produced. Check out the "Code: Green Comparison Worksheet" under Product Documentation & Videos below. Fill out the worksheet and see how much Code: Green can save you !!! 100% Money-Back Guarantee: If you don't believe this product is right for your business, we will refund 100% of your cost - even shipping back! See our Returns Page for more details. Free Shipping: Available on CleanCraft Brand Chemicals. Market a "Green" image with your company. Using Code:Green can put a "Green" marketing edge to your company. Here is an example of how one of our customers uses the "Green" advantages of Code:Green to work to his company's benefit. (Reported by Courtney Dunn, WBOY-TV). EPA/Safer Choice recognition does not constitute endorsement of this product. The Safer Choice logo signifies that the product’s formula, as CleanCraft Products, Inc. has represented it to the EPA, contains ingredients with more positive human health and environmental characteristics than conventional products of the same type. EPA/Safer Choice relies solely on CleanCraft Products, Inc., its integrity and good faith, for information on the product’s composition, ingredients and attributes. EPA/Safer Choice has not independently identified, that is, via chemical analysis, the ingredients in the product formula, nor evaluated any of CleanCraft Products, Inc. non-ingredient claims. EPA/Safer Choice provides its evaluation only as to the product’s human health and environmental characteristics, as specified in the Standard and based on currently available information and scientific understanding. No better Green cleaner on marker period! No better or more versatile product as a spotter. No better chemical that I stock or used for wick back! If you are looking to get away from all the big name brand and expensive products and use a chemical that is safer and greener then give Code: Green a try. If you have tried the other "green" products out there I think you will be impressed. It has a pleasant light scent and really works. I use it as a pre-spray in conjunction with CarpetCop as an extraction rinse through my truckmount and the combo works perfect for me. You can use it as your extraction rinse as well. I had a recent customer comment how well the carpet looked and she appreciated the house did not smell like 'chemical'. Give it a try! !